Founders Day Banquet of Metropolitan New York Zeta Phi Beta Chapters. The five founders of Zeta (seated, left to right): Viola Tyler Goings, Pearl Neal, Arizona Cleaver Stemmons, Fannie Pettie Watts, Myrtle Tyler Faithful. Standing, left to right: Brothers Rev. 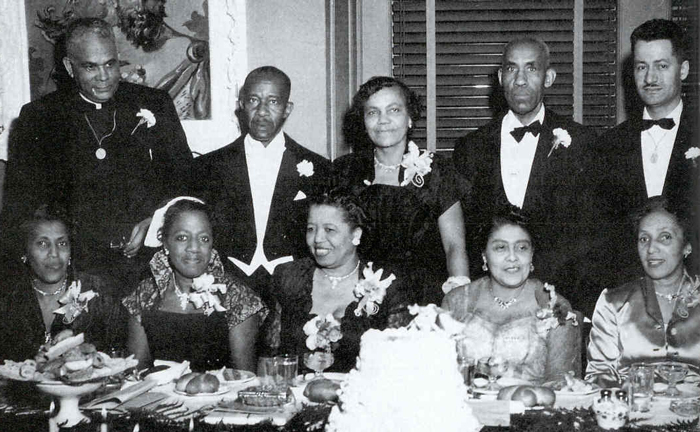 John M. Coleman, Charles R. Taylor, Mrs. Joanna Houston Ransom, former Grand Basileus of Zeta, A. Langtson Taylor and William E. Doar, Jr.